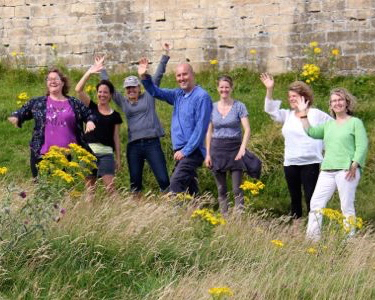 Openhand Facilitator Summer School 2017: "The Starsouls Emerge"
Openhand Facilitation goes much deeper than simply coaching. What we're working to do is connect with soul frequencies, through different densities, and to resonate them so as to create bridges into higher conscious awareness. If you can feel your higher self frequencies, then you get the chance to embody them, to your great benefit in daily life - you feel more connected to the source and the guiding flow helps make sense of twists and turns on the path as your life circumstances change and evolve. I was at a Sunday fresh veg market on the north west of the island, just chilling and minding my own business, when out of nowhere, a 'shiny eyed' guy approached me saying "You're Open aren't you? We called you here." It turns out he's living with a group of 3 Pleiadian star souls, holding a key energy centre at the apex of one of the valley's, and, wait for it... building an energy bridge for the Great 5D Shift. They'd come across the Openhand work and wanted to collaborate. It's a very small world indeed! Connecting starsoul groups into the bridge is of key importance to Openhand. What does that mean and why is it important? Many people who are drawn to this work, whether they fully know it or not, originate (as souls) from other constellations in the galaxy. Yes, we're embodied in human form, but in the nature of your soul (your 'soul ray harmonic'), you carry special frequencies that can support the shift for others and assist in the realignment of the surrounding energy field as Gaia shifts into the New 5D Paradigm. The point is, if you can activate these very special frequencies of your soul, then you're going to feel much more connected to your soul family and your true home in the cosmos. You'll unveil profound gifts of beingness you never imagined possible and then be able to help others feel, and embody, their own soul frequencies - it's just like striking a tuning fork, which then resonates in other people. 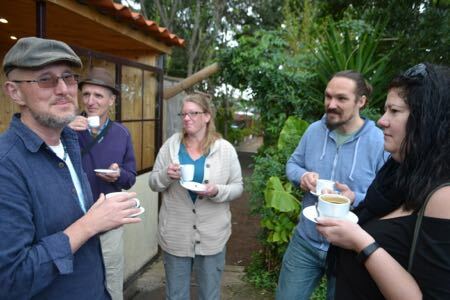 You could be sitting minding your own business in a tea shop, and yet having a profoundly beneficial affect on the field, which others there might well begin to resonate with! Souls have come here from many constellations such as the Pleiadies (all humans contain an element of Pleiadian DNA), Sirius, Orion, Andromeda and Arcturus (to name only a few). This last one is interesting, because the universe has been hinting to me about activating the Arcturus connection within the Openhand work - thus far, they've been quite a mystery to me, but I can already feel my soul intrigued by refamiliaristion. 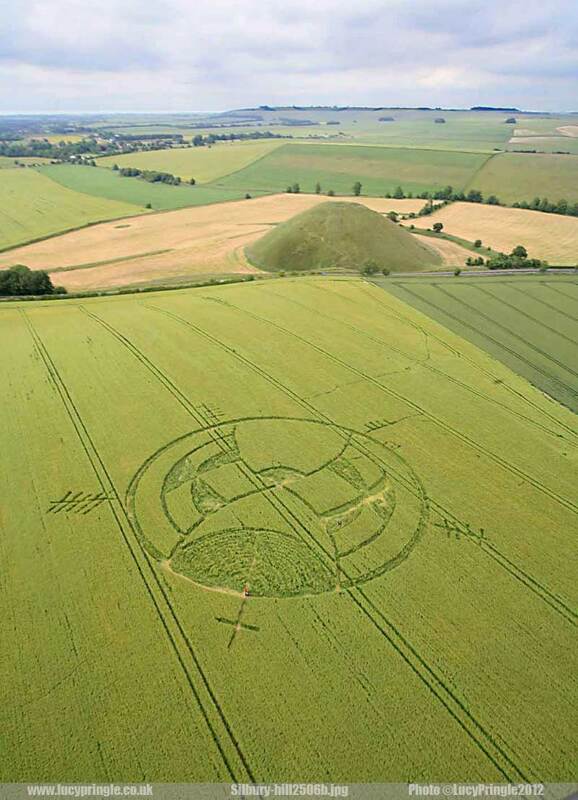 So what have the crop circles got to do with it all? Of course there's been much speculation (and even ridicule) about how the crop circles are created - "a bunch of guys with sticks and strings stealing through the fields in the dead of night". But if you've ever visited one, an authentic one, the notion is just a ridiculous as building pyramids with basic hand tools! The patterns are amazingly intricate, the geometry astoundingly precise, the crops carefully folded over and interwoven. They appear breathtakingly suddenly, and the energy in them is literally off the scale. So what are they? To me, they communicate messages through intuitive feeling. For example, a few years back, I was guided by the heart-felt pull to a place where the one in the photo had appeared, just as we had been remastering the 5GATEWAYS 5D Shift Movie. To me, it intuitively depicts traveling up from the base of a pyramid (representing the matrix in which we live), across a chequered path of black and white choices (representing the path), through 4 gateways into the Fifth Density. It activated in me an amazing sense of accomplishment and an acknowledging feedback loop from the universe. It warmed my heart! What does it take to be a spiritual facilitator? 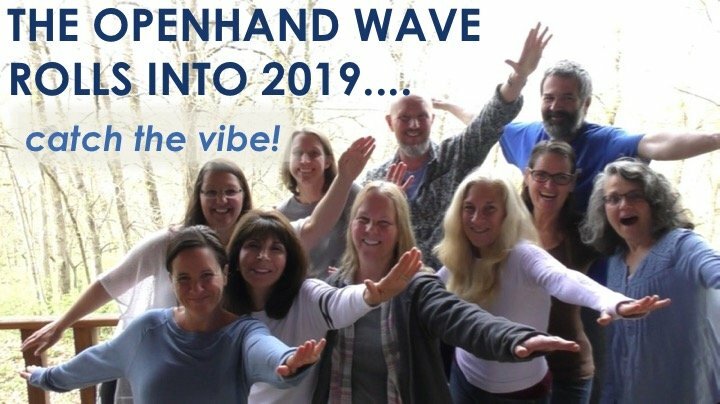 Yes indeed, everyone's buzzing with energy here, having traveled from far and wide, each having a truly phenomenal journey through life and excited about the prospect of being able to support the shift of consciousness taking place. 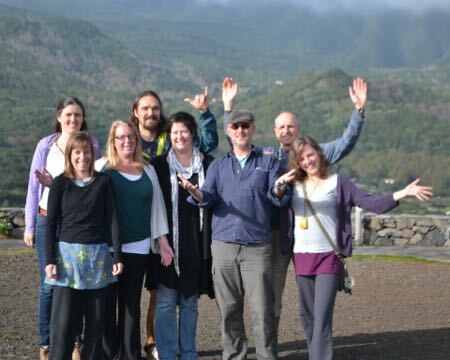 What does it mean to be a spiritual facilitator? Each person creates the reality they experience - nothing is ever done to you. So helping understand "why did you create the issue?" "how does it invite you to be more of you?" "what is the situation teaching you?" To always, but always, come from the energy of the source. It's less about answering intellectual questions and solving problems with logic - it's all about integration of soul. And by resonating soul frequencies through the facilitation work, the other can better feel themselves. 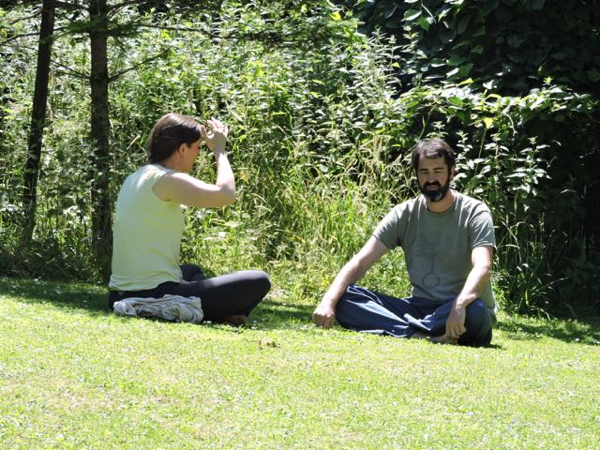 The advanced part of the Openhand facilitation work, and what makes this unique, is learning to feel the person you're working with, inside of yourself. We practice how to expand our field to embrace the person we're working with, then to identify within, exactly what is wanting to come up and move. When anyone ever has a problem in the outer journey of life, it always emanates from a constriction - a convolution - of consciousness within. Here lies the true issue, and to unravel that on the inner, facilitates realignment of the issue in the outer: the problem begins to unwind and right itself. So by expanding and encompassing the client's field, we identify the tightness within. 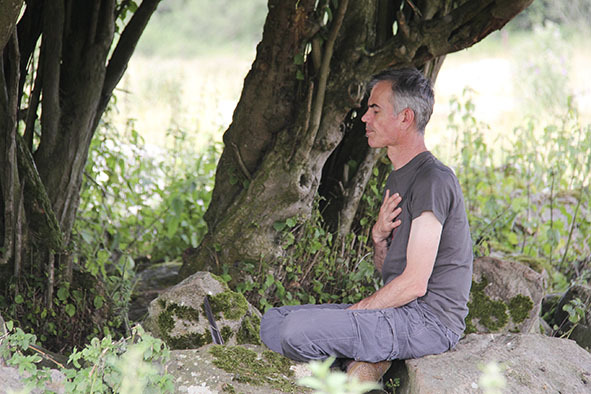 Then we bring active attention to the tightness - it catalyses the blockage, activates it, which we then help the client work through, using breath, movement, guided meditation and general unwinding expression of the pain. We then facilitate the emergence of soul by encouraging expression of what new aspects of beingness are coming through. It is truly beautiful to behold! Do let us know what 'crops' up and where the energy is at so we can hop aboard the shifts! Lotsa love to all the starry souls at the school in the sky in Avebury and elsewhere in the cosmos! Great to see you tuning in Cathy - yes, already it's turning out to be a pretty cosmic time. It's day 3 already on the Facilitator Gathering - wow, how time flys! The Facilitator work includes many different aspects. So yes, we're working one on one: helping to activate and integrate soul; clearing karma and blockages; releasing entities and implants. But we're also working in the field, helping realignments to happen to assist the free flow of energy in particular locations - such as energy hot spots like here in Avebury. Not to mention creating multidimensional bridges so benevolence in the 'ether' can support the 5D Shift. It's all immensely exciting and rewarding. So how to interpret them? It's an intuitive language, not absolute. It's kind of like interpreting a dream - how does it immediately speak to you? What is the metaphorical message? How do you feel about it? If you have a view, do share - in expressing these things, greatly enhances one's ability to read the interdimensional language. Out on the ground yesterday, it became clear we were working on specific energy 'leylines' in the location. So first it was about opening a heart-felt connection to the land, letting go of any mind control and just allowing the signs and synchronicity on the land to guide - always with the open question, "what would you have me do now?" Then following the pull, noticing what you see, and then feeling how to work energetically within that place. Leylines are historically considered to connect sacred sites in ancient times. But there's much more to it than this. It's not that the sacred sites created the lines, (as sometimes considered in the mainstream), but rather they are high energy lines within the field grid of Gaia herself. To me, they're about carrying high speed consciousness and information. The 'dark (satanic) side' are very adept at controlling locations - and whole regions - by projecting controlling and suppressive energy into specific leylines; including blocking them completely. It's a major aspect of the matrix in which we live. So when you look at a site, if you're tuned in, you'll see where specific structures have been placed so as to control these lines - like churches and chapels for example. So supporting an area to reclaim the alignment, involves connecting with the energy of these sites, feeling it within you, and allowing a natural alignment to return, simply by embodying and expressing your own soul consciousness - because at the highest levels, everything is aligned and interconnected. Often, when I do this, I experience removing 4D Opposing Consciousness 'technology'. Realignment in the field quickly returns, upon which, you feel the energy of the whole area beginning to lift. It's immensely rewarding. Many of us have the natural aptitude for this, and I know that many of you will already be doing something like it; and some will be doing it without even knowing it! Bringing awareness to these gifts often helps them reactivate very quickly. In realigning these energies, helps the 5D Shift progress more smoothly. A couple of lovely synchronicities we got having completed the afternoon, as we were standing in the car park ready to leave, a couple of telecoms vehicles passed us with "high fibre broadband" emblazoned on the side, and another in quick succession with 5 stars on it - yes, we'll take that affirmation! Stay tuned folks - feel the energy, we're having an amazing time! First thing I noticed when looking at the photo of the crop circle was the small pattern on the left. It reminded me of a scythe, and the thought flashed through my mind of "Time's running out." Nothing else came for a while, until I stopped thinking about crosses and symbols and felt into the image. Then it all came at once, kind of - the big pattern with the five whole circles the 5D; the small pattern with the circles cut in half the 3D. Halfway there? Half a life? Time is running out for the 3D, but there is a connection to the 5D - through the scythe, which can be a symbol of death - something people are afraid of - and we must go through our fear to get to the 5D. Sounds a bit grim, maybe, but the feeling I get is gentle and encouraging. A reminder: This is how you do it. 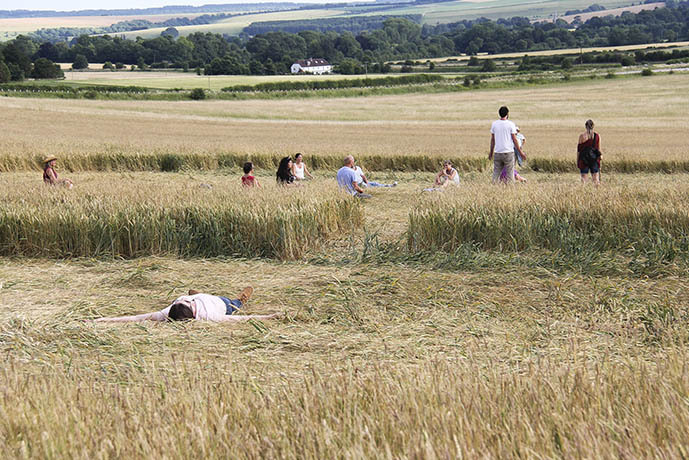 The crop circle says something to me about looking (or putting attention) backwards. My mind says this is just a human construct in my mind as we in the West associate moving to the right as being moving on or forwards, but the funny semi circle shape is located to the left. This intuitively says to me that something hasn't finished and needs attention before moving on. 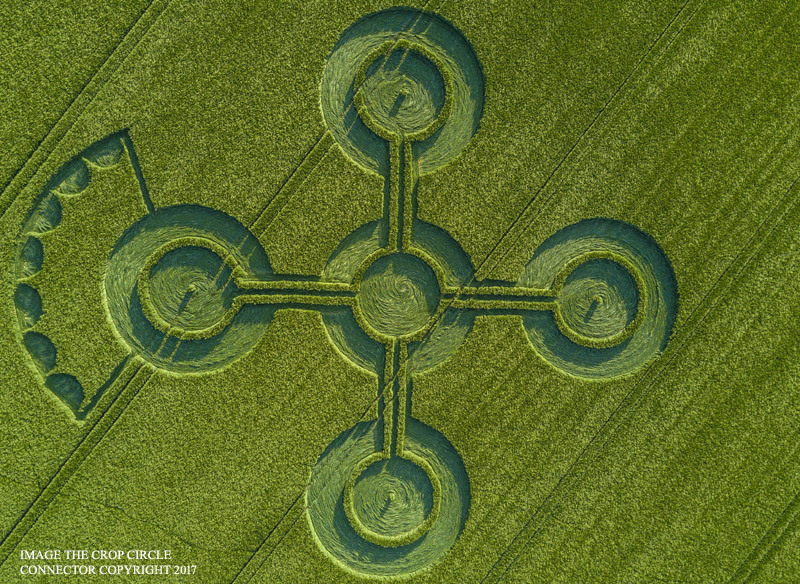 There are several images in the crop circle that speak to how I'm feeling these days. When connected with a line, the four outer circles feel like a box to me. That's how I feel. Boxed in by the matrix: physically, mentally, and emotionally. Each of these four circles has a smaller circle in the center. They feel like nails to me, crucifying me on a cross whenever I push against the inequity and injustice of the matrix and pay the price. In the center of the four-sided box is another circle. Five circles in all. That's the way out of the box. Through the heart center. Processing and transcending 4D karma to 5D. I know this but it's so not easy to keep going at times. The halo symbol on the left speaks to me of the Merkaba, the spirit-light-body of the 8th chakra above the crown of a human body lying sideways and flat: head, trunk, two outstretched arms, legs/feet together, hard to move. The seven semi-circles in the Merkaba remind me of the seven chakras, our way to wholeness, our way to coming full circle when we ascend to 5D by infusing the light of our souls through the blockages in the chakras. Getting up off the ground. Standing tall. Speaking our truth no matter what the outcome. Rising up. Being free souls to help liberate others. Shining the light to 5D. So I'm reminded by the imagery in the crop circle to continually go inwards, surrender and accept, let go, and infuse the light of my soul through my bodymind, finding the light beyond, transcending the 3D box, ascending to 5D. Where all life is served equally with unconditional love, compassion, honesty, and respect. How I long for that! Although battered and bruised, I am a relentless renegade, when all is said and done. Aware of the need to balance surrender and will, yet often struggling to do so. I take heart from the message of our starry friends. "We're here for you." The energy work we're doing here in the group is just off the scale. I'm bowled over by what these people are capable of. Society doesn't value the empathic capacity that such facilitators have. And I observe, as a result, all too often, facilitators lose their confidence or else doubt the tremendous beneficial impact they can have. Let's remember: everything is of consciousness. And therefore, it can all be affected at the consciousness level. So yesterday we were developing skills of creating vortices, by feeling the field inside of ourselves, then unleashing blocked energy within it. It allows the energy to naturally spiral through the dimensions. It creates ascending and descending channels - ascending to support the 5D Shift; descending to clear convoluted energy, which is then 'composted' through the galactic core. I know it may sound a bit 'out there', but in the fourth density, space and time are no object - you move through space-time-continuum at will, and rapidly. If you can connect to a particular centre in the cosmos, then you can channel energy there. And there's always 'the dark side' to contend with. 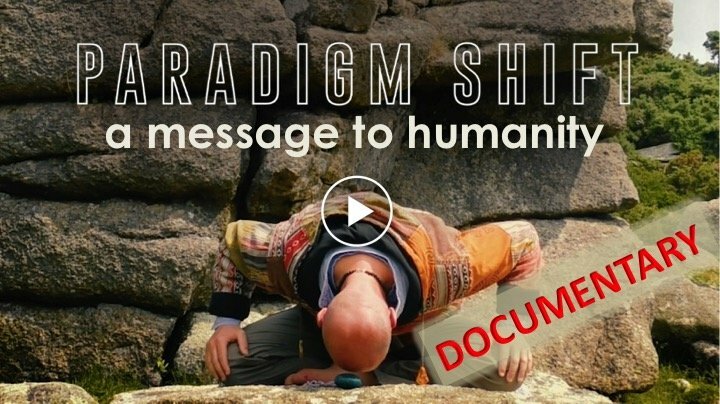 It's only when you begin to do this kind of field work, that you realise how much of the matrix is held in place, how much of the field controlled, by dark energetic forces - that's the underlying reason why the planet is in such a mess: the matrix is being held purposefully in place so as to exploit people and resource. But when you become aware of how this is done, then you can unravel the 'dark magic' that controls key centres. Yesterday we were working at this site - Silbury Hill. It's a man made neolithic monument in the centre of the Avebury area, which acts kind of like a 'key stone' for the locality. It seems to act like some kind of fulcrum, swinging whichever way the balance of power is shifting. Let's be clear, what we're doing is not imposing any kind of controlling intention - absolutely not. Our approach is to become amplifiers for what naturally wants to happen - we're facilitating realignment, through ourselves. Marije & Rich - the calm before the storm - Marije literally had Rich lifting off the ground! I have never - ever! - seen an energy vortex created like that! But hey, whose judging, it looks like fun! Do tune into the sense of what we're doing. 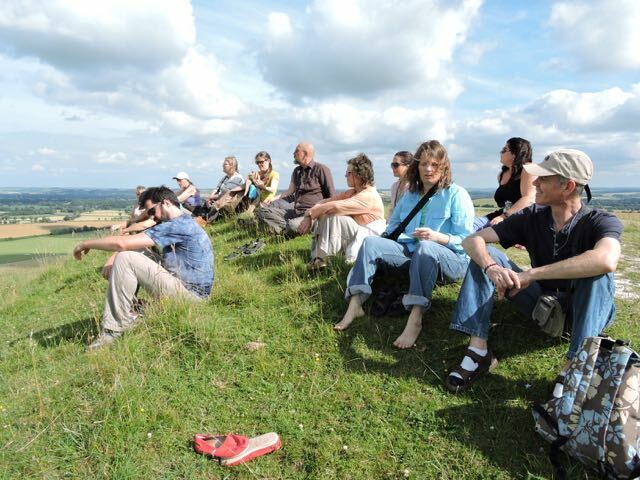 Avebury is a massive energetic centre, the crop circle season is getting into swing, and there's starsoul groups connecting from everywhere. It feels like starsoul grand central!!! 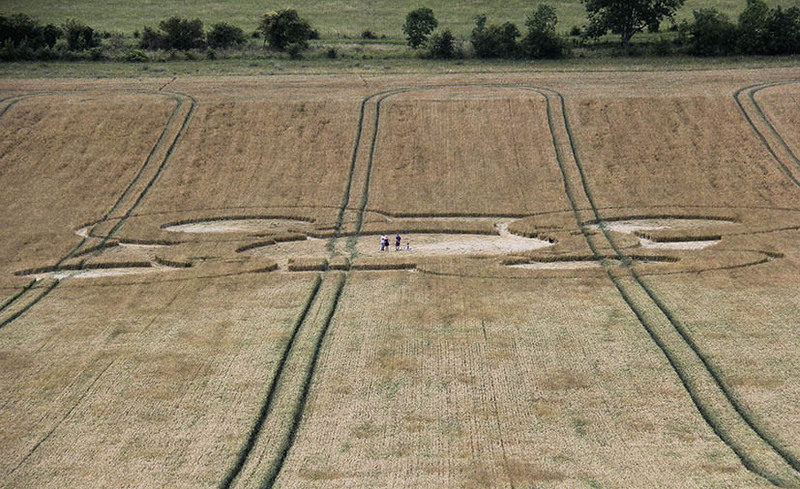 So this spectacular crop circle appeared yesterday not too far from us, at 'Battlebury Hill' (interesting name!). It would seem to depict the 'four worlds' leading to the fifth one. And are those pairs of small circles gateways? Lovely to get a feel of the work you are all involved in the school! Very intriguing! First, let me say that I had only heard about crop circles and had come across these in a book I read many years ago called The Bermuda Triangle. Many moons on, the discussion of crop circles came up again with Rich, who explained more to me about these circles and shared with me some resources. Truly fascinating! 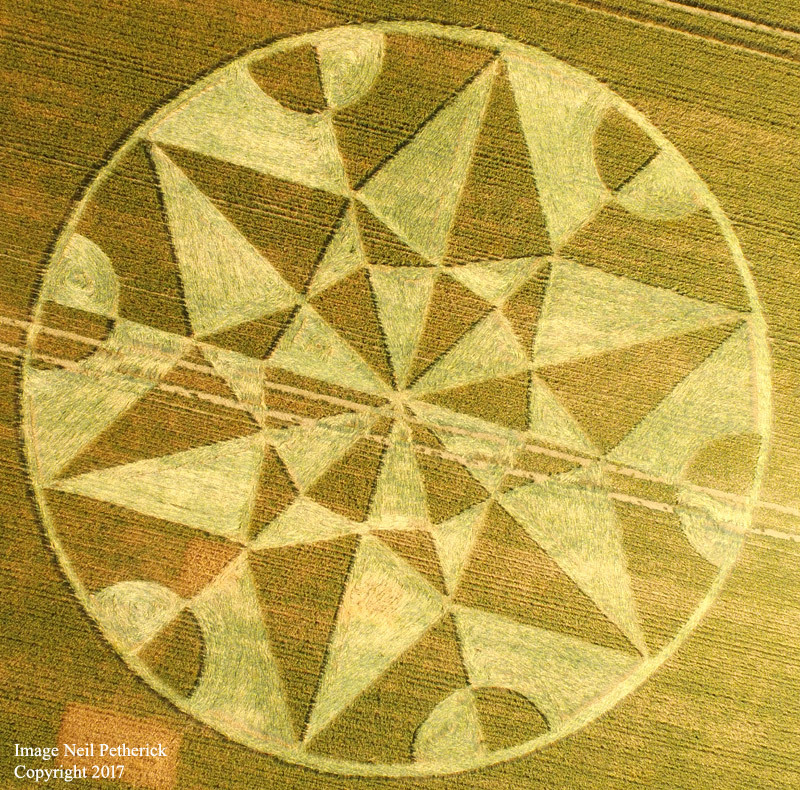 So, this crop circle, which is SO beautiful, speaks to me of the interwoven multiple cyclical layers of consciousness. The background yellow circle that encompasses all the others is pure/spirit/cosmic consciousness. The 4 smaller ones are a) Earth/sense/elemental consciousness, b) Heart consciousness, c) Mind consciousness and d) Soul awakening consciousness. The one on the centre is separation consciousness/karmic conditioning, which is the key force spinning all the other 4 smaller circles. The pairs of smaller circles are gateways – one goes in and out depending. “Everything is of Consciousness”, indeed. Consciousness is everywhere, it is universal and All life is sentient – this is called Panpsychism in Greek ancient religious and philosophical practice (panpsixismos). When I get asked: “Where is your consciousness?” I’m usually taken by surprise… ‘which one of them’ me thinks?! In Buddhism/s there are many meanings and types of consciousness, so some types are sense related, some are karmic related, others are related to meditative absorptions and others to enlightenment and the universe (Source). But all are interdependent. So, pure universal consciousness has an experience of conditioned sense individual consciousness or it arises as Earth tree consciousness or manifests as an out-of-body experience consciousness and so on. Very interesting. Again, I need to translate most of these words to my vocabulary, experience and understanding…it can be frustrating to do this so often and there are also gaps. And I am aware of the feeling of being an outsider arising! Well, well, nothing new there, so I find compartmentalisation works well when engaging with self-discovery within groups and approaches. In light of this, I have been pondering for some time what ‘type of soul’ may I be, mostly out of curiosity and adventure rather than a strong belief. Personally, I am not keen on categorisations of any kind, unless they fully empower the individual and also encourage one to ultimately deconstruct identities, particularly the spiritual identity. In my search I came across various approaches to categorising someone according to soul origin/type. Two of them stood out for me but to keep this short, will refer to one of them. So, this one talked about how a person can be part of multiple planetary Soul groups not just one. Upon reading the characteristics of the soul groups mentioned and although I can see parts of myself in all, these 4 stood out more in my consciousness: the Alpha Centarian, Mission Realm, Polaris and Mintakan. Mmmmm...The process of categorising myself is very interesting and an opportunity to inquire for sure! Does it serve and how? When to drop it? What matters most? Etc etc. What's the benefit of knowing your star origins? Yes, there's a definite risk within 'soul categorising' to create spiritual identity. Definitely something to watch... "I am from so and so" - then taking on some kind of ownership, pride, glamour (a big one) or even as far as subtle one-up-man-ship. But there are also most definitely benefits I've frequently observed in exploring possible planetary origins. Let's say you may have lived predominantly within a particular soul group from a particular constellation - or a number of well defined ones. Then within these soul groups, will be defined resonances of one's soul-ray-harmonic - the frequencies of your being. Simply by forming a bridge back to that soul group or constellation, and experiencing that connection again, can ignite those qualities and resonances of being within you. New aspects, with profound gifts, come alive in you. You're literally reacquiring lost aspects of self. Many starsouls carry the karma of feeling disconnected, abandoned, cut off, misfit, a 'fish out of water', not accepted, or they just plain 'want to go home'. Often I have seen the confusion result in extreme integration problems (here on earth), leading even to suicidal tendencies. Which can be avoided by finding those soul frequencies, and integrating them, here and now, on earth - you bring home to you. A dormant aspect of you comes alive again. You no longer feel out of place. What's more, you become able to call on that energy in support, any time, any where, any place. Wherever I am, I never feel alone or unsupported (at least not now). Yes, we can master being on our own and not needing support, but once you've moved beyond that, once you've accepted it, how about having an entire etheric team at your call - all bringing their energies to bear in one time and location? How about maximising your consciousness in that way. What might it be able to create? I love seeing this happen to other people, thank you for sharing that because it makes me just smile. Immediately what I saw in the new crop circle was a reflection of what I am learning at the moment. I once did a little circle piece with calligraphy and within the circle I wrote a quote from some unknown person from times past. It reads: The nature of God is a circle of which the center is everywhere and the circumference is nowhere. Basically it emphasizes my realization of "I am an infinite being, just having a human experience." Also, it looks like all of you are having such an amazing experience!!! Yayyy for you! Open, thank you for such a thoughtful response. Particularly for receiving my questions with such openness and understanding because at times people meet my questioning inquiry with defence, which is then expressed in a fight, flight or freeze response. And it can be painful at times. Though I have learnt a lot indeed! Open, you acknowledge the ‘risk’ associated with ‘soul categorising’, which offers - to me - a well-rounded/inclusive and grounded approach to this. I also very much appreciate the benefits you listed so eloquently and most of all, I care about and embrace your personal experience with being a star soul yourself (as I understand) and also working with other star souls. I work with people who don’t fit in and want to commit suicide all the time…and I love being with them for as long as it is. Love feeling the collective energy through the photos. When I looked at the crop circle I saw one energy portal folded in on itself that gave the physical appearance of separation yet the energy is moving continuously through it. The dots look like charging ports to accelerate the energy through a perceived barrier that is truly just a density manifested within the physical construct! It looks like the four circles are folded in yet if the circles flip into a higher dimension the energy moves freely. I'm looking at the underside of the circle and the impression it leaves here in the physical form...how the consciousness of Gaia feels having been touched and reminded of all that is above yet touching her so gently. Shout out to Amy!!! I love you, thank you for being such a deeply reflective, insightful, strong, wise soul and sharing all of you with me last week when I so needed to see my reflection in you!!! Further reflections on the first crop circle you posted, Open. The crucifixion imagery continues to stand out for me. The Merkaba symbol on the far left morphs into a crown of thorns above the body of Christ crucified on the cross. Complete surrendering of ego and identity. Transfigured. Resurrected. I'm feeling the energy of Christ consciousness emanating from this crop circle. Unconditional love. The second crop circle appears fairly straightforward. A journey through the five gateways, which are very narrow, indeed. One must drop all the baggage, all the attachments and identities to finally step though the 5th gateway. I'm reminded, once again, of this Bible verse, Matthew 19:24. "And again I say unto you, It is easier for a camel to go through the eye of a needle, than for a rich man to enter into the kingdom of God." What really grabs my attention in the second crop circle are the labyrinths and the swirling, spiraling energy that jumps out. 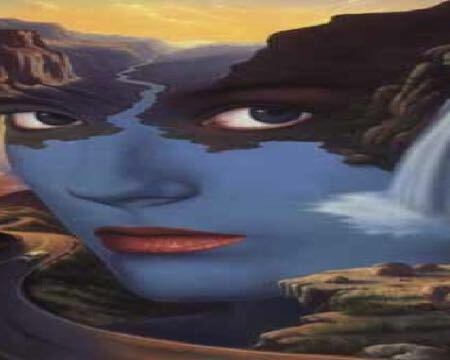 Two streams of consciousness: walking the path from separation consciousness to unity consciousness. This quote from Morpheus comes to mind. "Neo, sooner or later you're going to realize just as I did that there's a difference between knowing the path and walking the path." Note to self. 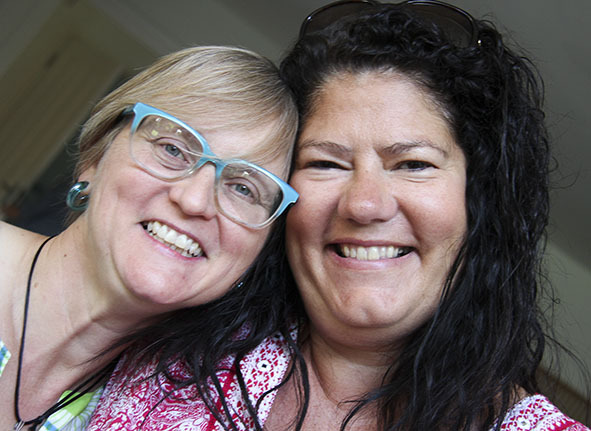 Aspasia and Open, I appreciate the discussion around exploring and connecting with one's star soul group. These days I'm feeling a strong resonance with the blue ray Pleiadians. The blue light beings in the film "Avatar" feel like family to me. I was on a serious shopping mission this week. I simply had to have blue bed-sheets! I made a bee line for a particular store and there they were waiting for me. I can't express how comforting it is to luxuriate in that colour frequency. The comfort of home. As I was free-wheeling on the Internet yesterday, I found this 2003 animated film, "Interstella 5555: The Story of the Secret Star System." Music by Daft Punk. Blue light beings, rock musicians, are kidnapped by a raptor record producer who disguises them as humans and programs them to forget their true identity. The group makes it big playing soulless corporate pop. 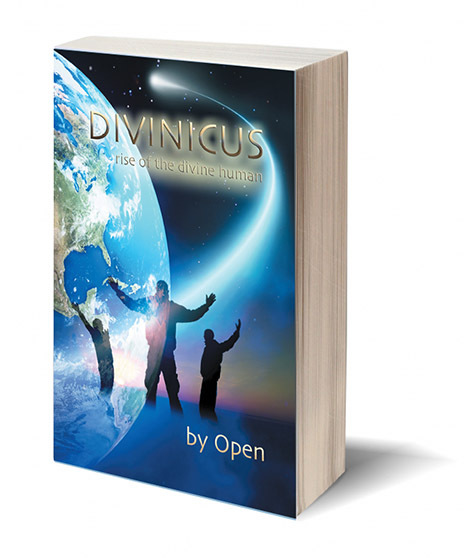 Eventually the humans break free and return home to the light beings they are. Sound like a familiar story?! For the past week or so, a particular song has totally captivated my being. For me it's a celebration of our connection to all the star souls and light beings here on earth and out there far and wide throughout the cosmos. The song is so full of joy and love. It makes my heart sing and sing some more! It's by Brulé and is called "The Star People, A Message for All of Humanity". Mitakuye Oyasin. We are all related. One heart and one mind and one body. Cathy, you must be well tuned in - I brought the Avatar movie with me to the Summer School, because I felt there might be some resonances in it for people. So yes, there is a very First Nations Pleiadian feel to the "Navi" in the Avatar film. They're an interesting blend of qualities - they have the 'star people' feel, yet they're very connected to nature. They have a playful, light, loving, community sense, but passionate warrior too - I see this today in many Pleiadian souls I come across. Blue is most definitely their colour - you might see it in their eyes or what they choose to wear. I hasten to add, the 'avatar sense' is metaphorical - not literal. Return of the Pleiadians and Earth Energies Reconciliation). Interestingly, I did some scouting around the internet to see what others were saying about star soul qualities - how do you know which constellation you might be from? I've seen wild and fantastical explanations, many which contradict. Some for example point to the channelings of Edgar Cayce, who suggests it is the Arcturians are tall and blue, holding the 5th Density vibration of the New Earth. To me it shows the limitation of channeling - there must be a direct interrelation of your active awareness, balanced through the language of synchronistic interplay, in order to form a true and aligned picture. I have the strong sense - and have received much synchronicity - that the Arcturians are quirky, smaller, very metaphysical - the character Yoda in the Star Wars movies comes to mind - interestingly one of the signs outside our centre on the main road yesterday was "Yopa" - but the p written in a way that looked like a d. I've come across several in the Openhand community who have these kinds of traits, who also felt they had some connection to Arcturus (I have known many of these starsoul groups in previous incarnations, but for the purpose of non-judgment, I am preferring to reacquaint from first principles in this unique situation). There is indeed a great deal of fascination amongst the group about where they might be from. I strongly suggest always, but always, look only for the influences and resonant gifts that might possibly come through. And bear in mind, that many of you will have had lifetimes in different star systems, not just one. And at the end of the day, it's what you're being here and now that matters, not what you were were being way back when. Although as previously stated, making these connections can, and will, activate dormant gifts of beingness, which can be utterly priceless. Yesterday, we encountered the reptilian and draconian energies in strong measure. The former is a distant cousin of the latter, who spread their DNA throughout the universe via intentional panspermia (sending out their DNA via asteroids). In fact the reptilians populated the earth (by that method) many millions of years before humanity - it is their consciousness that caused the rapid rise of the dinosaurs, and when they were obliterated (synchronistically and fortuitously by a comet), their consciousness hung around (in the ether), looking for a new host through which to act - the lower qualities of humanity (excessive consumption, controlling dominion and greed) are the embodiment of those qualities through the lower chakras. If you want to see the perfected expression of that energy today, of division, polarity, racism, using fear to manipulate and control, then look no further than "Mr T" - he is the very epitomy of that energy. There are most definitely still beings of that nature (not in human form) here in the first and third densities (they don't have much of a second density - emotional - presence), although you won't see them with human eyes, because they have a different frequency of vibration. And they've been very responsible for controlling the way the consciousness of the planet has been heading. The gathering benevolence in the dimensions have been doing much work to relocate them, back to their original home of Draco (which to date, has only been partially successful). 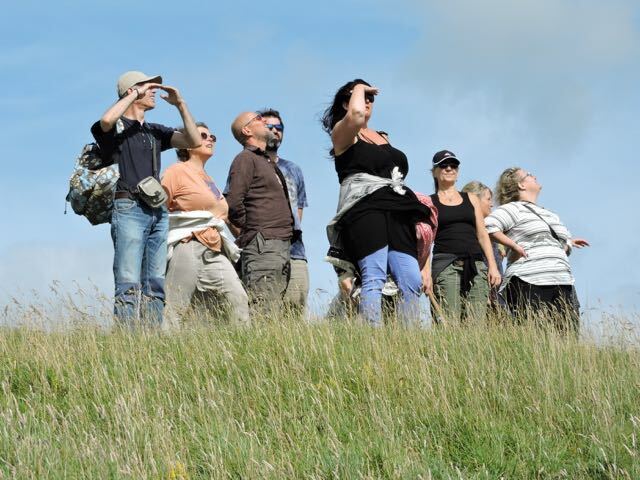 Yesterday, I took the group to what I knew to be a 'hive' location - a hidden valley in the Avebury area, which has controlled the balance of power here for probably eons. A year ago, I was guided to the valley and spent a very challenging night there - at one point, this 'raptor consciousness' invaded mind and body and pretty much took it over, so I couldn't move it. I was literally locked in place. They were projecting fearful and negative energy to try to control. I am quite used to this however - very aware of it. And so I know that fear is the only thing they can really manipulate at this point - so I didn't find it that hard to break in the end. Nevertheless, it was fascinating to watch, from the conscious observer vantage point, and understand how easy it is for humanity to be controlled by that energy. 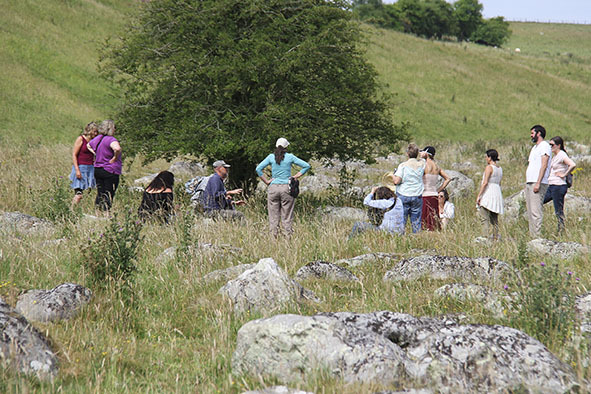 Yesterday, it was beautiful to watch a fearless and loving group (as we were), gathering in meditative circle in the base of the valley, then connecting with that consciousness, showing it strength but compassion also, and then forming an interdimensional bridge assisting them to leave. A huge element to it, was presenting the fearless divine feminine, that which has been so manipulated and controlled by the raptor energy throughout human civilisation. But you have to be very careful how you approach this energy - if you simply "project love and light" (as many starsouls mistakenly do), they'll simply lap it up and thrive from it, twist it, and then manipulate you with it. Consequently I see many starsouls and teachers, inadvertently channeling that energy through the love and light vibration - it seeks to own you by it. At the same time, if you try to fight the raptor, you'll simply end up in a rare old 'ding dong', ebb and flow, battle which goes nowhere. What you have to do, is show strength and determination, whatever the apparent personal cost (even if that might lead to death) - overcoming any fear that might arise, surrendering contracting tightness in the face of it, but definitely not retracting. You show them you're prepared to take them right to the edge (I often show them the galactic core - and obliteration through it). That way, you gain their respect. Now you open a channel. Yesterday, we presented to them their karma, images and feelings of how they'd brutalised the divine feminine. I could immediately feel this took them into great shame. Which while greatly weakened the hold and anchoring of the energy, would not ultimately heal and realign it. This is where forgiveness then became important (but only then). It was important to honour and reflect (telepathically) that raptor consciousness also serves an invaluable purpose - it holds dense physical realities together, so that karmic lessons (of being lost in the physical for example) can be explored. Showing them love in this way, showed that we empathised with them. As we sat in circle, great healing was taking place, which was immensely fulfilling. A bridge was opened to their distant draconian cousins - I find it always essential to give such Opposing Consciousness hope, meaning and purpose - here is the next realigning chapter of their evolution. These thoughts, projected telepathically, began to dislodge the group, who then finally let go and moved on, through the ether. I can't tell you how spectacular that felt - it's this energy that has been greatly responsible for so much suffering on earth. The result was, we could feel the whole energy of the location lifting. It also allowed other starsoul energies to more easily enter the area. It was deeply rewarding. So that's a basic insight into the kind of field work we've been doing. 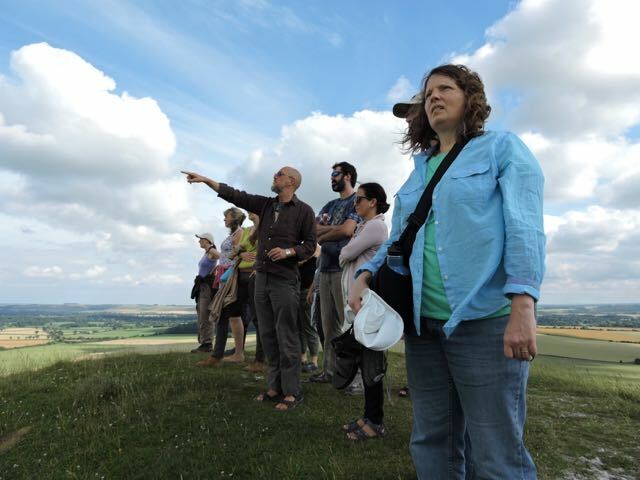 It's incredibly moving and inspiring to read about the realigning work you all are doing in Avebury. Deep bow and much gratitude. 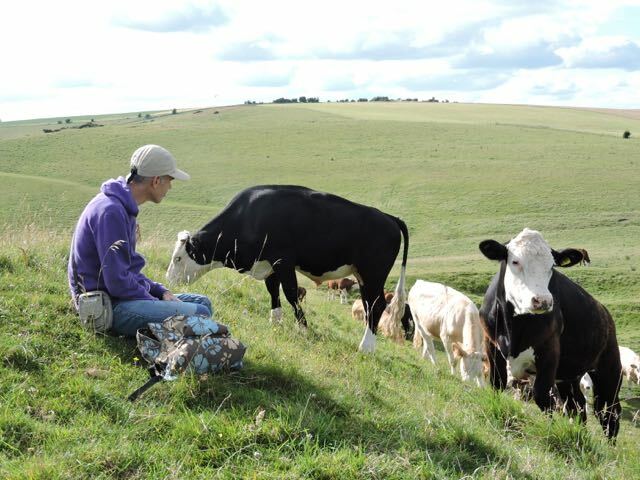 I have felt my soul calling to travel over to Avebury and the surrounding areas each day this last week. Amongst other guided ‘assignments’, I was working at one of the sites Open mentions above over a couple of days; separately from the group but it seems tuned into the same energies. I first parked the car which was immediately swathed in a swarm of black flies and an ambulance flew past with sirens blaring, a warning and a calling. It felt ominous. Dark oppressive energy hit me; and I felt like I was walking into a pit of snakes. But was receiving detailed guidance with where and how to work. Connecting with the reptilian/draconian energies and also the guardians of the land, the natural energy lines and grids, trees and stones. I could feel the attack that I was under at points and also the manipulation in trying to draw me into visions and distractions but was able to clock it quickly with the help of guides. And on the second day felt the body of an enormous snake removed from underground and release. It is lovely to hear the feedback that you guys felt something similar at that site and to feel the energies releasing and re-connecting / flowing to other sites. On the way home I felt blessed to cross paths with an English equivalent of a White Buffalo and an English equivalent of an Eagle flying alongside the car, amongst other streaming synchroncities; beautifully tuned into the language of the universe, tears of ‘rightness’ and gratitude flowed and also a feeling of sadness for being alone (although of course I wasn't, never am). Working solo (in a physical sense), was playing into the awareness of separation consciousness, at the same time as flowing with unity consciousness and expansion of all. 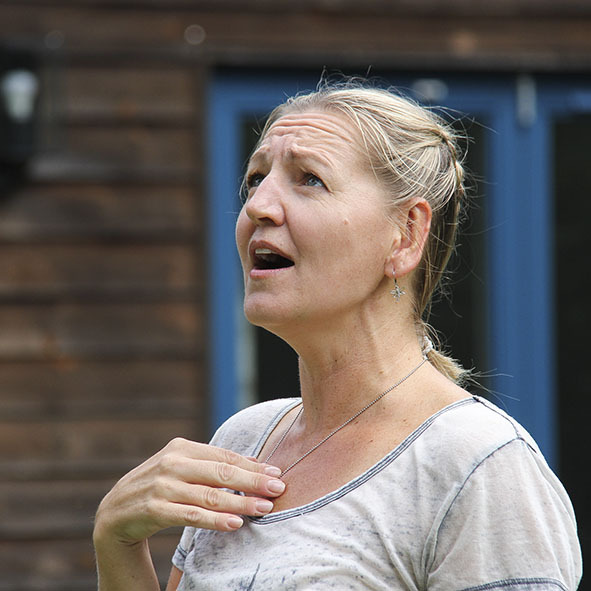 It felt like a long and rewarding week, full of connection and flow and has been lovely hearing about the group activities from Amy today. With deep love and connection. How do you sum up such an incredible gathering? It's almost impossible, but I'll give it a shot! It turned out to be about connecting with our star frequencies, activating and embodying them, and then applying them with our cousins in the ether, to bring about realigning shifts of energy in the field. And wow, did we do that (thanks for being their too Michelle - you were definitely working there in concert with us, even though not staying as part of the group - it's always great to get that alternative affirmation <3). Wow, the energies were off the scale. Sitting in the centre circle, I could clearly feel the typical clockwise descending spiral, connecting through the earth and into the galactic core. The crops had been carefully folded and interwoven in that spinning direction (anyone whoever doubts the nature of these, need only ask the question: how do you bend each individual stem, at ground level, interweave them, and NOT DAMAGE THEM? What kind of physical implement could possibly do that with so many stems, in such a short space of time, with no visible inroads through the field?). Each of the outer circles had a contrasting anti-clockwise ascending spin. As we sat at various places in the crop circle, it was clearly impacting each of us in uniquely contrasting, yet interconnected ways. We had to work to keep the space open, particularly from an intervening fleet of greys, which paid dividends - because right near the end, was the most emotively heart-warming connection of the week: two of the group renewed an ancient star connection to Andromedan energy - which I could clearly feel come into the circle. 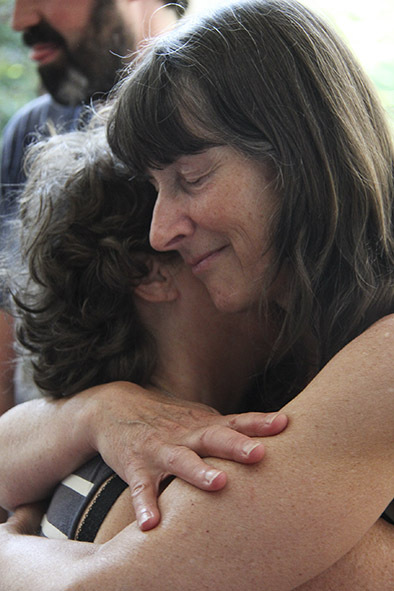 For one, it was a massive infusion of kundalini energy with many joyful tears of reunion. It was both magnificent and humbling all at the same time. 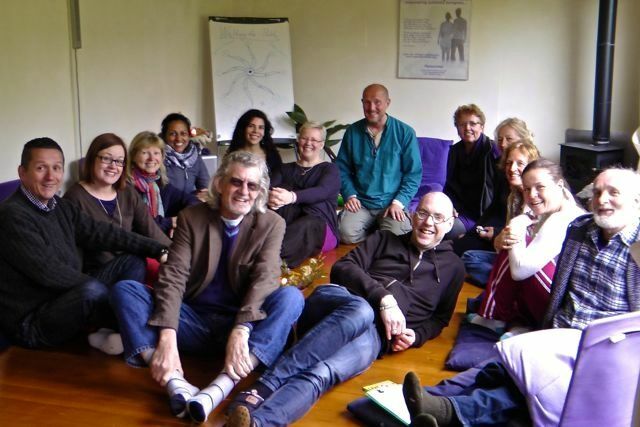 It was the perfect place to anchor energy, and for each of the group to form the earthing for their own multidimensional bridge - to connect with their own team, that they might be helped to find more accurate alignment and manifesting support in their daily lives. Words cannot express. What a stunningly magical week. 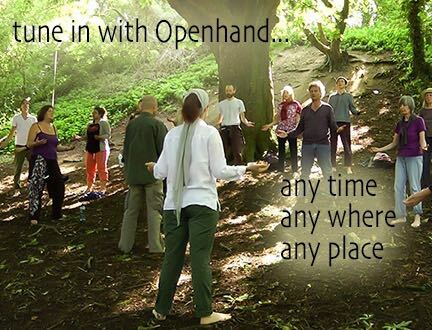 It was an honour, a pleasure and a privilege, for the Openhand Team to host you all during this amazingly sacred time. You will remain in our hearts always. I agree - a full inhalation and a long exhalation of WOW!!!! - Releasing so much anger at being left here on Earth, and reconnecting with the soul family and guides. Feeling the boundless, unconditional love! - The banter, light-heartedness and joy that permeated the week, along with the deep, deep work - lets take life seriously without being serious! - Sweet Child O' Mine on the bridge. - Pool, wordplay and Sardines! Wonderful inner child expressions with all my brothers and sisters. - All the signs and synchronicities. Getting followed by a massive paper dragon while free wheeling. - Watching the personal, group, energetic and global 'story' unfold during the week. - The amazing team work at each of the energetic sites - all working individually, yet enhancing each other. 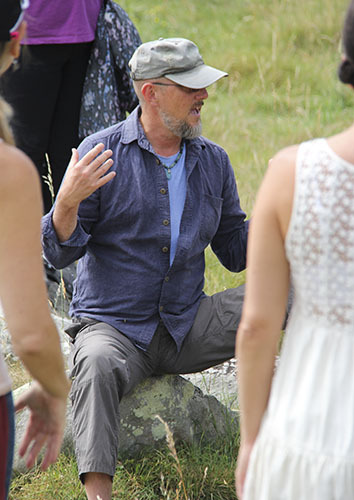 - Standing up at the rock field, to discover that all the rocks I'd been connecting with has flowers on them that perfectly represented my soul configuration and origins. 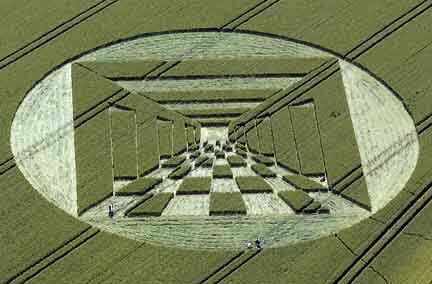 - The crop circle! Reuniting with all my star soul origins (it turns out I'm a bit of a nomad) but especially with the wonderfully beautiful Andromedans! It blew me away to be an anchor for that energy coming in, although I felt really 'spacy' afterwards - thanks guys! - Last, but definitely not least - being with the Openhand soul family. Words cannot express how much you guys mean to me - each and every one of you holds a special place in my heart. If I could make these words jump off the page as you read them and embrace you all in a big bear hug, I would. Finally, a special thanks to Open and Trinity. Open, you hold so much energy for us, supporting and yet catalysing, answering our bombardment of questions, even when you're exhausted - most of all shining a light for us to expand and empower ourselves. Thank you from the bottom of my heart. Trinity, your angelic presence is so nurturing. You nurture us with you soul enhancing food and with your soul supporting energy. It was also a great pleasure have so much fun with you this week, brining so much life! Much love to all, always. Looks and sounds just fantastic, my friends. How wonderful that all sounds. And those circles ... truly fabulous! Sweet children of the universe! Let's all hold hands with the trees and the stars, and boogie on! After dropping Jean-Michel off in Devizes, and before dropping Fiona at her destination campsite in Glastonbury for the night (the Pleadeians quite clearly guided us there), Fiona and I were treated to a wonderful dance of synchronicities between the divine feminine and masculine (the masculine was clearly shifting and changing to 'meet' us - lovely!) As I dropped her at her campsite, I sensed there was more to do before returning to Castle Cary myself for the night. The weave took me to a place called Pilton and I was led around by dragonflies and little shrews, chance meetings and symbology in the landscape until the universe could get two people in the right place at the right time for a meeting that the whole merry dance seemed to be all about. The church clock chimed three and I turned into a lane and became aware of two motorbikers ahead of me. The field was indicating that they were my next step. They called out to me, 'Do you know the way to the tithe barn?' Ha ha. I did. I hadn't been there - I had walked towards it earlier and felt a pull, but then the pull took me away again. So I directed them there and thought my job was done. But then as I returned to my car I felt a strong pull to walk to the tithe barn myself. Aware that they might feel that I was 'interested' in them (there was a definite energetic thing going on between myself and the younger man) I tuned in again and then followed what I knew to be an authentic pull to the barn. Having picked up some wonderful clues (a Land Girls monument at the barn and some symbology between two trees which meant a lot for my personal journey) I then was led to these two men again and a story unfolded. They were a father and son team on a year-long outward-bound field trip. The task? To find hidden landmarks in the environment (!) - from Scotland to Lands End - over a year-long challenge (which they did at weekends). I was all the time aware of this attraction in the field between the son and me - he had a wonderful Pleadeian energy and big sparkling alive eyes - but didn't feel that that was what this meeting was about - and so focused on reading the signs and ensuring that what needed to be achieved was achieved. Anyway, by synchronicity, our journey ended with the two buying me a drink and the three of us sitting in a sunny spot outside a local pub and then what the meeting was about unfolded. The younger man, it seemed, was in charge of educational training in the army (aha!) (and had connections with the Warminster military bases, where our group were doing some of our energetic work the other day). I questioned him and it seemed that the way that the army were recruiting and training people was changing (this was key! - and perhaps, Open, 'confirmation' that the energetic work we were doing in the group had been effective?) - and that where they still needed focus (divine masculine characteristics, I logged) and people who were prepared to follow orders, both he and they were more and more aware of the necessity for the intuitive qualities of the divine feminine - and for initiative, autonomy and individual character to be valued, rather than just being able to follow orders, and this was very much honoured now when they were recruiting... Bulls eye! I knew that we were getting on to what the meeting was about. When they left, I offered my hand to them both and the younger man said no, let me give you a hug! - and his father followed suit (again, indicating to me that the weave of energies in the army were changing - and there was perhaps a shift and healing taking place between the divine feminine and masculine too). Smiling, I looked down at my glass and in plain letters on the back (I had specifically asked for a 'girlie glass' for my beverage at the pub, as I would enjoy my drink better in that) was 'Cornish brewed and made' (or something like that). I had my next step! Looks like I may be seeing you, Rhonda and September, in Cornwall next week after all! It was such a magical week - thank you all. And what stars you are! What an incredible week...It was the greatest gift to be with you all...time was both fast and so incredibly full. 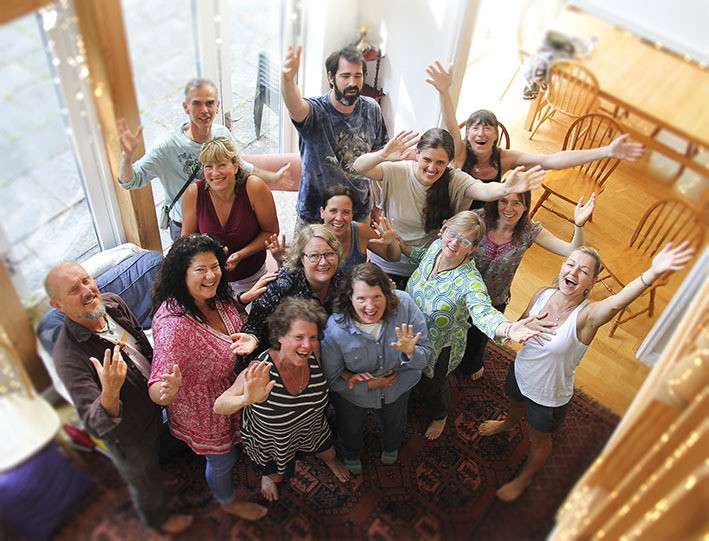 I felt so completely at home being with you all - sharing physical space, enjoying amazing meals, deep, powerful work, so much play and lightness, open-heartedness, adventure!! Coming into the course I felt strongly to get all new tires on my car before I set out on the journey...what a feeling that was - a perfect mirror of feeling a greater confidence in my vehicle as it meets, the ground, the road...navigating the potholes and the flooded places with a sense of being anchored within myself. This is very new to me...and it was spectacular to witness the beingness that comes naturally when I am rooted inside myself...how simple that is...to know and feel me while in relation to others. It's very exciting for me =) and I feel massive excitement about how this is unfolding and bringing me into a joyful expression of the energy here in a physical way. I see things lining up before me...areas that have challenged me such as frustration at perceiving that I must bear the effects of others lack of taking ownership, hearing and sharing impact without blame, and allowing feelings like anger and judgement to be felt inside without needing to project...to focus on my own self-realization in the moment and then right action will come from there...these are the thorny areas for me right now that I am seeing and experiencing the way through...synchronistically after we dispersed I stepped into a 2 cm thorn that went right into the side of my right foot at the base of the big toe. On our last day we spent some amazing time connecting to our soul guides/groups and then set off for some free wheeling time in town. The word bell kept spiking as we headed into town. I had exactly 5 pounds in my pocket, (I had left my wallet behind and Kim graciously lent me some cash in case something came up). Almost immediately, I saw a sign for a place called bow bell and it caught my attention...but it was literally a sign for a place further up the road...so I continued on, sure that I was going into this place to connect to something as yet unknown. Just as I arrive at the front of the shop, Tonya (aka Truly as I felt to call her =)), tells me "have you seen this place, I feel like there is something in there for you" lol!! Just in case I missed everything else, here she was expressing the flow - thank you! What beautiful souls you all are and I feel so incredibly lucky to have been in this hallowed space with you all...it was truly timeless and I will carry it with me in always. Open and Trinity - thank you for a magical, heartwarming adventure. Oh wow. A combination of my blessed morning coffee ;) and reading this thread has me on the ceiling in sheer joy. I feel so blessed to have experienced a truly amazing week with you guys, present, near and distant :) the word collaborative was shown to me on arriving home and I've learned so much form working in a group of such diversity yet all with the unifying thread of divine service. Some where up there in the thread Open when talking about star souls you said you bring home to you, a dormant aspect of you comes alive again... I've felt it and I'm still feeling it. It's so freakin' AWESOME. And yes Cathy, Viggo baby! Big love back to Erica and Shell and big love to you all - heart warming to meet in person new openhanders and connect on another level. Thanks for holding and facilitating the space Open and doing your best to herd the cats ;) and thanks Trinity for the delicious food and the reflection I needed at the perfect time. Wow, what an amazing week! I had to pinch myself a few times during the week to know whether it was really real or just a dream. What to say? There is so much and yet so little to say. So let me just share something about what stood out for me most, namely the power of unity in diversity. Or as Open nicely put it earlier ‘sovereign, yet blending together like the colours of the rainbow’, which is exactly how I experienced the group dynamics throughout the week. A group of unique individual souls with very diverse qualities and energies blending together into a powerful, yet playful, force of nature. How different this is from the typical push for uniformity and conformity from the matrix through politics, culture, religion, spiritual mainstream, the media, etc., which makes it so much easier to control and disempower people! Not surprising that mavericks are tyically condemned by the matrix for not fitting in, because they are beyond its control and thus a potential threat for its existence. What an amazing feeling it therefore was to spend a week in a high energy environment surrounded by fellow mavericks, without the need to comply or conform to anything other than my own uniqueness! It made me realise how much internal conditioning I still have around this and despite always having been a maverick at heart, how much I still tend to compare myself to others and how much shame, guilt and fear there is about ‘not fitting in’ and therefore ‘not being good enough’. And how in that way I give away my unique power and become more easy to influence and control. For example, when the ‘spiritual mainstream’ lady in the crop circle was calling us to all come together to join hands and kept on beckoning us ‘come in, come in’, I will admit that I did feel a certain pressure to give into her persistence, even though I didn’t feel like doing what she proposed. How liberating and empowering it then felt when our group just went its own way, with each of us doing their own unique thing within the crop circle! So much gratitude to all my fellow rainbow mavericks, looking forward to further strengthen our contrasting unity along the path! And special gratitude to the Openhand energy for making it all possible! P.S. Love the unedited Openhand style video! Particularly the very beginning with Jane searching for a spot to leave her DNA on the weak bridge ;). What a week it was! 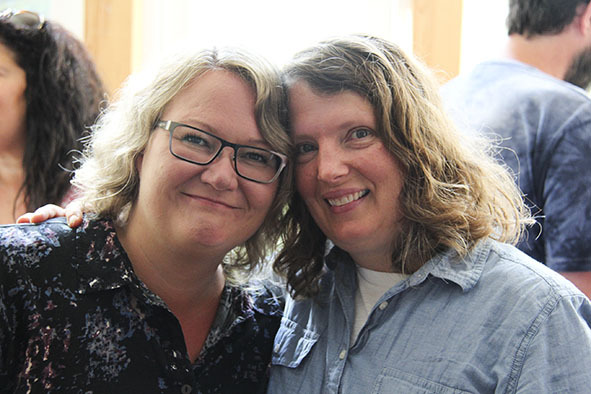 It just seems to get better and better, the more OH courses and retreats I participate. This was my absolute favourite so far! The group was just amazing, such a different each and every one of us yet our energies dancing together in such a great harmony. That alone felt powerful and refreshing to me. It was a beautiful balance of digging deep, holding the space, expressing and exploring inner and outer fields, sharing, playing and so much more. Thank you Open, Trinity and everyone of you who were there, I feel blessed. It was made sure that wouldn't leave without really knowing that the cosmic connection is here in 3D within my reach at any time. No we don't walk around holding signs saying "I'm Arcturian", "I'm Plejadian" or "I'm from the 8th dimension" or anything like that but make no mistake; w e a r e h e r e. Read the signs, ask for help and my favourite: ask "show me" and watch what happens. Magic does happen and it is cosmic and it is real. It is just as real as me wearing this human suit. I enjoyed greatly of everything that we did but if I had to choose a favorite, the last full day would be it. The signs were speaking in volumes right from the morning. The rocks we visited was powerful. I felt the pull to walk to a corner that felt nice. I heard the cows going little bit restless behind me and calling out for each others. When I reached the corner and looked back the cows had followed me and were staring at me like "what are you up to next?". I didn't know if they were dangerous to be close to when they has babies so I left the space for them and found a new spot for myself. When I returned to others, I witnessed a breathtaking view of so many Starsouls standing tall on their own rocks, apart from each others but still connected to each others and to Home, communicating in silence. It reminded me of the similar scenery in the Wim Wenders movie called "Der Himmel uber Berlin". The City of Angels is Hollywood version of that. The movie (original version) left me speechless when I first saw it at the time way before internet. In Marlborough (was that it?) I stepped in a time capsule, literately. There was a puppet show in the church and at the doorway there was a tile on the floor that read Time Capsule on golden letters. There was I standing on it feeling it out if I should enter or not :D (I felt not to.) But what a metaphor, huh?! It was so wonderful to finally experience a crop circle, perfect ending for all the field work we had done during the week. Also it was good reflection to witness how different spiritual generations know how to work with energies. I know Open often says this what we do is advanced work but what is natural to you doesn't feel that out of ordinary until you get something (possibly) ordinary to reflect it upon. 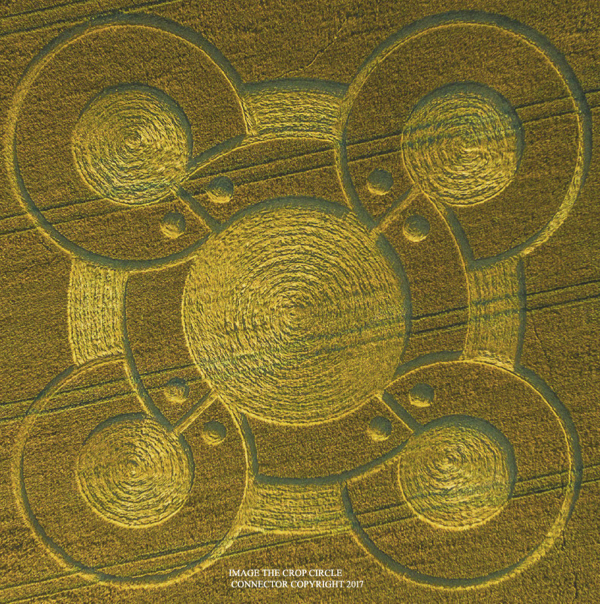 Incredible pictures and awe inspiring work being done .. love those crop circles, I've been reading about those lately .. can't wait to experience one in the flesh.. love the sweet child of mine video too ! An amazing record of a totally off the scale experience. Since then I have felt like Frodo returning to The Shire.